Have you ever gone to the store for one thing and returned home with a dozen things, except the thing you went to get? I do that at the Farmer's Market...often. That's how I came to own more Butternut Squash than anyone needed to have for one week. What's a gal to do, but use it as an excuse to heat up some butter and wine and make Risotto? It's what the Italians would do, so who am I to question fate. 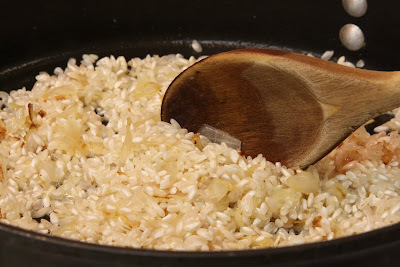 I find there are a few keys to making authentic Risotto: Use the correct rice (round or semi round, like Arborio), heat the rice and coat with oil/butter well in the pan before adding other liquid, after adding the wine make sure to cook it down to au sec (almost dry) before gradually adding the stock. 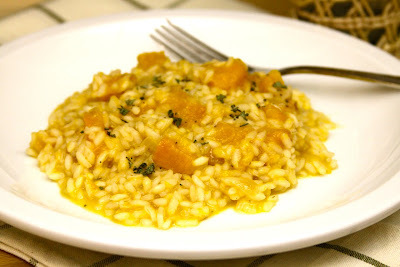 In some Squash Risotto recipes, the squash is added to the rice as it cooks, but I like to roast the Butternut in the oven until it's nice and caramelized. Then, cut into cubes and add as one of the last ingredients. That way, the squash still has a nice clear bite to it, but its texture is still compatible with the creamy rice. 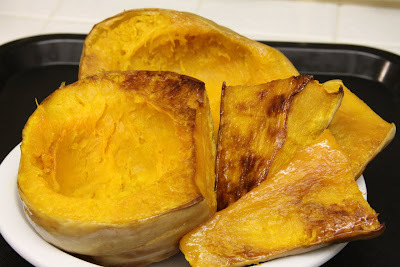 Cut the Butternut Squash crosswise small top from bottom bulb. Cut each half in half from top to bottom. Drizzle w/Olive oil and salt. Roast in oven on 350F, cut-side down on baking pan, for 20-30 minutes til fork tender. Turn once, halfway through. Cool and scoop out seeds. Peel and cut into bite-size cubes. Hold. Restaurant secret: They make the Risotto to the point of half-way through the "adding the stock" part. The rice is definitely only half-cooked. They spread it out in a large baking sheet to cool, cover and refrigerate. It's cut into serving sizes and brought to room temperature and the cooking, adding stock and cheese is done per order. Quote from my older son: "Oh Mama, (garbled eating), yeah...is there more? 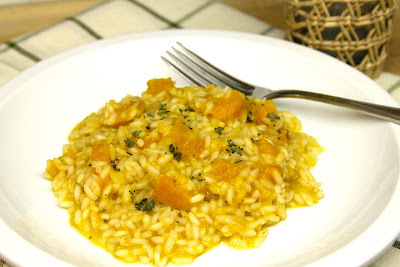 There's a butternut squash sitting on my counter and aborio rice in my pantry... sounds like dinner tomorrow night! Thank you! Karine: glad you stopped by, thanx. Misty: thanx! Love to hear that! Orange & Pinot Jelly; YES I CAN! Hang-Over Pop-Overs for Breakfast at Noon.